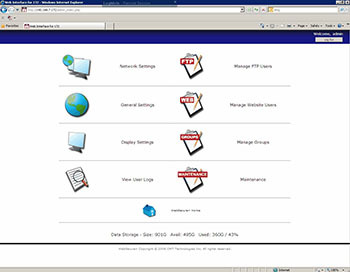 WebSecure+ is a stand alone web server for win-OMT's popular iMediaLogger Digital Logger. 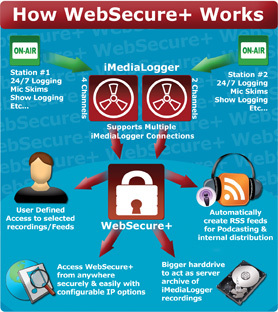 When combined with iMediaLogger, WebSecure+ provides a secure managed storage and distribution center for the automatic ingest of iMediaLogger audio recordings. 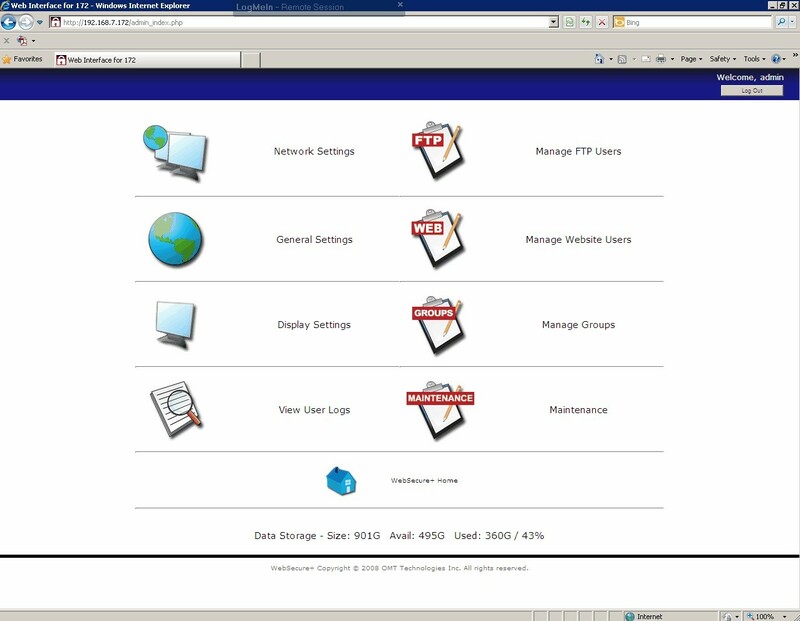 Using your Intranet or the Internet for WebSecure+, audio assets can be archived and their access managed through an intuitive WebSecure+ configuration interface that allows user accounts to download and/or to audition audio assets. Logged content can be shared with both internal personnel and offered to public radio listeners through podcasts. Stations using multichannel iMediaLoggers who require a more comprehensive solution for multiple personnel accessing logged recordings will find WebSecure+ to be the perfect solution. Add even more power to distribute your logged audio to stations, staff, advertisers, affiliates or podcast subscribers. With WebSecure's ability to handle over 200 users at once, distributing your content has never been easier and more reliable! WebSecure+ can support 4 or 8 iMediaLogger feeds simultaneously and is the perfect solution for mass distribution and storage of your iMediaLogger recordings! With support for iTunes and RSS feeds, your staff can automatically have selected audio content downloaded right to their computer. No need to search or browse for what you need. Simply subscribe to a selected WebSecure+ RSS feed and automatically receive iMediaLogger recordings through iTunes or any other RSS capable program. Over the Internet or through your network, WebSecure+ allows access from anywhere in the world with it's configurable IP and network options. The familiar web based user interface let's you find, browse or subscribe to content quickly & effortlessly. Download or stream content right from your browser using any standard Windows audio player. Set up listener podcasting to your website with ease. With support for iTunes & RSS, podcasting with WebSecure+ and iMediaLogger has never been easier. Simply select the external podcasting option in WebSecure+ for a selected iMediaLogger feed and integrate the direct link to your website and podcast your recordings to the world! WebSecure+ is a powerful web server that utilizes a MySQL database and is interfaced through the Apache webserver with PHP. It uses a Linux OS to provide a highly efficient software application suitable for Web Appliance and Server applications. Create both individual and group access to iMediaLogger recordings through WebSecure+ definable network permissions. Make sure the right people are getting the right logged audio - intuitive administration options allow you the flexibility to insure content is getting where it needs go. WebSecure+ can act as a dedicated storage and management server for your iMediaLogger audio content. No more purging or organizing to make more room for future recordings. Keep all your logged audio off your iMediaLogger machine and into your new centralized distribution and storage center. Websecure+ comes to you pre-configured on a reliable Linux operating system. The system is priced based on the number of iMediaLogger feed connections and users required to fit your station's needs and budget!